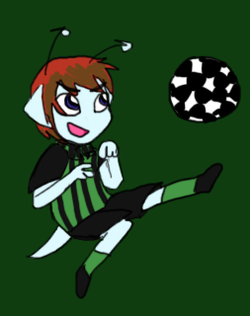 Goumi grew up as a soccer star, being an important player on her team, frequently leading them to success. However, despite her sporting success, once she got into high school, something felt off. She still rocketed through the soccer matches, even earning a scholarship to a nice college for her skills. In the first semester of her junior year of college, she suddenly quit the team after dealing with a leg injury that would keep her benched. Quitting, of course, made her subsequently lose her scholarship, and rather than trying to deal with it right away, she's decided to take a break for a year. In that time, she placed the two problems - one was the external "I'm no longer interested in soccer," and the other was an internal "I don't want people to see me the wrong way." After announcing her break from college, she went back to live with her older brother, SP, and came out to him--- not only did he accept her with open arms (and later Howo and Dowo when they see her again), he helped her to come up with a cute fruit name to match her older sisters. She's very happy to finally have a break and find some sort of identity apart from sports (right now, archaeology sounds like fun). ref needs to be redrawn! the current one is goumi pre-transition and color change (i have not drawn this character since 2013), please don't draw her right now!